Woo hoo! The tickets to the Illinois State Inaugural Ball on Monday, January 19th came on Wednesday and it wasn't just two tickets in an envelope. We got two individual packets with our tickets, a formal invitation, a letter with details on what to expect, travel instructions & map. My BFF Valerie has confirmed that she got her packet too. Saaweeeet! will be held. 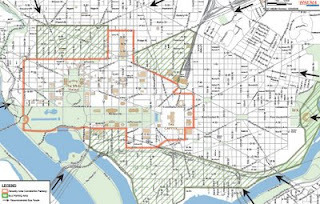 The Eastern boundary encompasses the US Capitol with Independence Avenue being the major southern boundary. Within the security area, there will be no movement of vehicle traffic allowed (other than public safety vehicles) from 3:00 PM on Monday January 19th until almost 5:00 AM on January 21St. Concrete barriers and a heavy police presence will enforce the restrictions. I decided to call the restaurant we are having dinner at prior to the Ball (Acadiana's) to confirm our reservations and the travel restrictions. Yep...not even a cab. We are going to have to catch the metro in our finery to the Gallery Pl/Chinatown station and walk a few blocks to the restaurant & then across the street to the Renaissance. The whole evening is prime fodder for NUMEROUS blog posts. Awesome! However, my weekend doesn't just start with dinner & a Ball on Monday. We start with the arrival of my classmate & friend Walter Cunningham and the Dartmouth College Gospel Choir & Chicago One Accord. Walter is the Musical Director of both and they received an invitation to sing at an Inaugural Brunch by the Inaugural Committee on Sunday. GTFOOH. My man is BIG TIME! The only problem they are having is that they need help housing about 20 people from Chicago on Saturday night. If I gotta put them all on air-mattresses in the basement I will, but I'm not worried. I'll take a bunch and I'll find some friends and/or alumni that will too. In addition, we are working to have a smaller group sing at the West Point Diversity Leadership Council Inaugural Event at the Army-Navy Club on Sunday. We actually have a few "dignitaries' & "appointees" RSVP'd to attend. Maaaaan! We are gonna have a great time. We are NOT going into the city on Inauguration Day. I'm just not doing it unless I get tickets from my Congressman/Senator for the event. I'm still waiting to hear back from two of them but it is hightly unlikely. If the best I can do I watch it on a jumbo tron squished up against a gazillion other people (and at 5'2", I prolly won't get to see the jumbo tron either) freezing my azz off...I'll take a pass on that. We plan to watch it on our own personal jumbo tron (the home theater) in warmth & comfort, drinking mimosas & having a fabulous brunch with family & friends. So, what ya'll got planned for the Inauguration? Come on, spill it.